The term “soil health” describes how soil functions. A healthy soil can improve crop yields, nutrient cycling, water infiltration, and resistance to erosion. Ogallala region farmers need to know how to maintain and improve soil health, particularly in areas where the aquifer resource has been or will soon be exhausted. Soil teems with life. A teaspoon of soil can contain as many as one billion cells belonging to thousands of individual bacterial species, one million fungal species, and thousands to millions of algae and protozoa species. All of these microbial groups — called the “soil microbiome” — complement each other’s contributions to healthy soil function. The soil microbiome regulates 80 – 90% of important soil processes including decomposition, nutrient cycling, soil and water detoxification, and disease suppression. The soil microbiome at work. One important measure of soil health is how soil particles are bound together to create soil structure, which affects water infiltration and storage. Soil fungi play an important role in binding soil particles together to help create and maintain soil aggregates or soil structure. Arbuscular mycorrhizal fungi are involved in root and soil interactions that lead to plant nutrient uptake. Actinobacteria help decompose complex substrates found in soil, such as lignin. Other bacterial populations including Clostridium, Azotobacter, and Rhizobium help fix nitrogen. Soil organic matter (SOM) is a critical component of soil health because of its roles in soil nutrient availabiltiy, soil water storage, and in providing the environment that sustains the soil microbiome. Soil organic matter is made up of plant, animal, and other materials in various states of decomposition. Changes in soil organic matter are identified by analyzing portions of soil organic matter that decompose readily and those that are resistant, along with soil microbial activity. How much SOM builds or is maintained within agro-​ecosystems depends on several factors including how much SOM is present, soil management practices, and environmental conditions. The metabolism of micro-​organisms also affects soil organic matter changes. In the Ogallala aquifer region, low levels of precipitation, coupled with high evaporative demand, leads to lower soil organic matter levels compared to those typical for soils in the Midwest U.S.
Rainfed agricultural production typically leads to less plant biomass compared to irrigated production. In low soil organic matter situations, the soil microbial community composition shifts to one that can function with limited carbon inputs; in this scenario, soil microbial community diversity may decrease, influencing further soil organic matter accumulation. In limited irrigation and dryland systems, conservation tillage practices that keep the soil covered and fed with plant residues is expected to improve soil organic matter and the soil microbiome’s adaptation to climate variability, including prolonged drought, and to increase water use efficiency and crop yield. 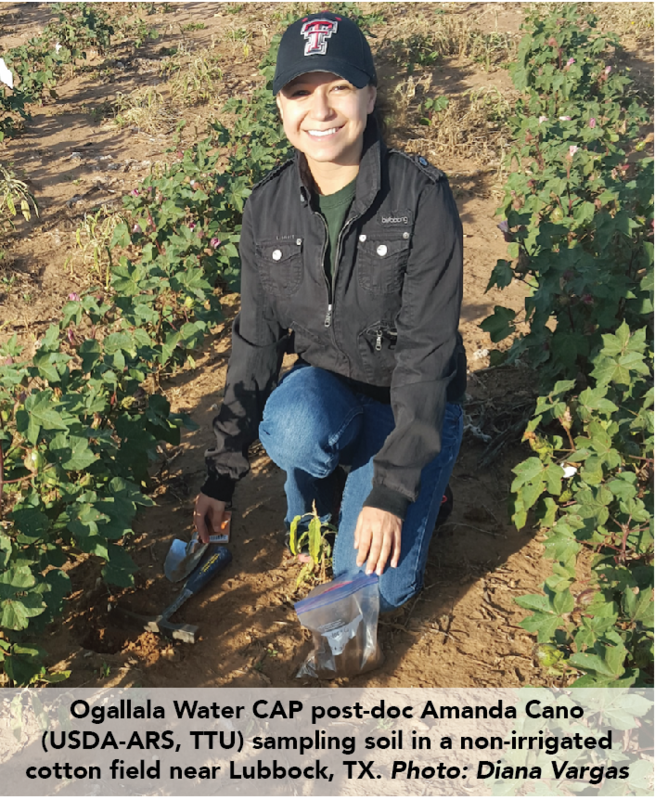 Dr. Veronica Acosta-​Martinez is a soil microbiologist and biochemist with USDA-​ARS based in Lubbock, Texas who studies how the soil microbial community is affected by management selections and climate variability across the OAR. In her lab, Dr. Acosta-​Martinez looks at how the size and nutrient cycling activity of soil biomass (a.k.a. the soil microbial community) is affected by different field management practices, to identify practices that effectively promote soil health. WATCH (12 min): “Transitioning to dryland cropping systems.” Dr. Acosta-​Martinez discusses research on how drought, precipitation, and management affect soil health in the High Plains/​Ogallala aquifer region. Dr. Rajan Ghimire’s research team based in Clovis, New Mexico at NMSU’s Agricultural Science Center, investigates how conservation tillage systems, cover crops, and crop residue management practices can, by minimizing soil organic carbon loss, improve soil health and water conservation in dryland and limited-​irrigation cropping systems. 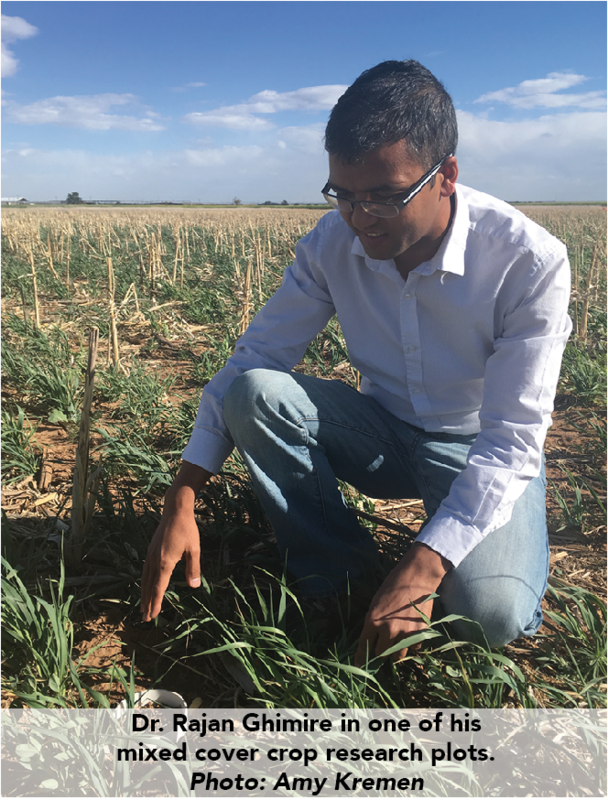 Recent research by Dr. Ghimire’s team showed 18% more soil profile organic carbon and 13% more nitrogen in grassland soil profiles compared to cultivated sorghum field. Soil microbial biomass and enzyme activity, other indicators of healthier soils, were almost double in the grasslands. 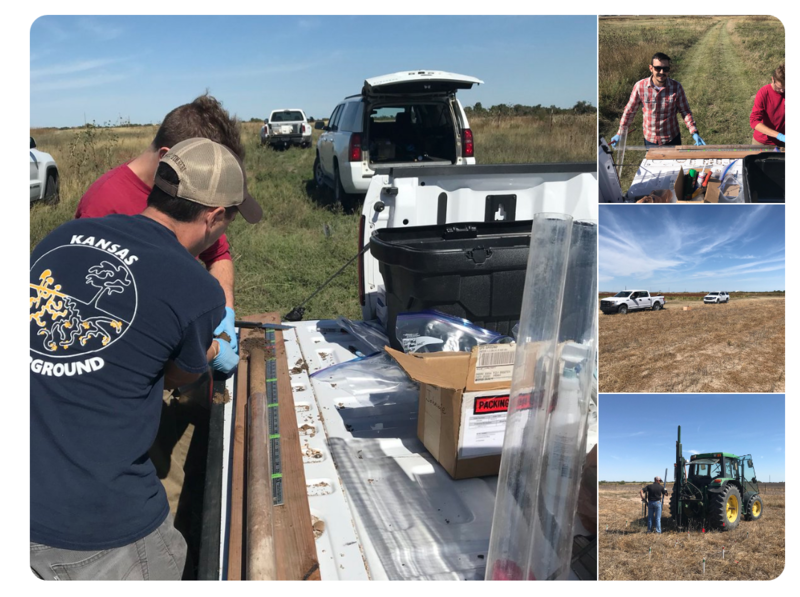 Dr. Meagan Schipanski and her team at Colorado State University have partnered with Ogallala region producers to evaluate soil sampled at different time points elapsed since fields were last under irrigated management. This information will be integrated with data from an ongoing experiment at a CSU field research station to better understand the processes behind soil health changes during the transition from irrigated to dryland production. Agricultural practices developed in the wetter climate of the eastern U.S. are being adapted and modified to support successful, rain-​fed production by focusing on building healthier soils for improved resilience. Visit drylandag​.org to learn more about how dryland farmers use crop rotations to enhance diversity, plant cover crops to keep the soil covered and increase soil organic matter, integrate livestock into their cropping systems, and apply no-​till farming practices. Scroll to the bottom of the dryland​.org homepage for a storybank featuring 8 interviews with innovative dryland farmers and scientists. Dr. Chuck Rice’s research group at Kansas State University is assessing soil organic matter, soil aggregation, and microbial community structure in undisturbed prairie and no-​till and tilled annual cropping systems. In less disturbed systems (prairie, no-​till), soil organic matter and nutrients increase, creating an environment which supports soil micro-​organisms, especially fungi, which in turn increases soil aggregation. Such soil potentially has greater water availability, because the improved soil structure permits greater rainfall infiltration while reducing erosion and evaporation. Sampling soil to study how the microbiome is affected by land use across Kansas’s precipitation gradient. In the Ogallala Aquifer region, as producers in some areas shift away from irrigated production (predominantly corn) to planting more dryland wheat, sorghum-​based rotations and/​or other less-​standard crops including forages, over time, a new carbon balance will be reached. Depending on the shift in crop rotations, this transition may result in increased or decreased crop residue inputs into the soil and, thus, different impacts on soil microbial communities and soil health. Typically, it can take several years to realize the benefits of shifts towards soil health-​oriented management. With a proper selection of crop rotation, tillage, and other relevant management practices, it is possible to maintain a healthy soil for limited irrigation or dryland production systems for future generations. The best management practices for soil health will depend on each region’s climate and soil conditions. Nonetheless, maintaining or improving soil health during a transition to dryland will play an important role for agricultural sustainability and resiliency in this region and in similar agro-​ecosystems worldwide facing increasing water limitation and climate variability.